For the past two months almost everyone has been talking about the upcoming heads up challenge between Tom “Durrrr” Dwan and Patrik Antonius. 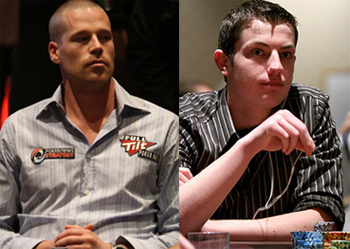 All of the online forums and even the chat boxes in some of the highest stakes poker tables have been flooded by players and fans of the game asking when the match is going to begin and there has even been some speculation that the challenge that Tom “Durrrr” Dwan laid down was nothing but a publicity stunt that Tom “Durrrr ” Dwan thought of. Well we can tell you that the match is not a hoax and the match between Tom “Durrrr” Dwan and Patrik Antonius has begun. The match began just the other day after almost a week of waiting for Patrik Antonius who is currently in Thailand with some family and friends and unfortunately in Thailand the internet connection is not the greatest. However Patrik was able to figure it out and the match has finally begun which makes a lot of railbirds very happy since the online cash games have not really been seeing any kind of action because of the LAPC going on currently in Los Angeles. If you do not remember Tom and Patrik agreed to play $200/$400 PLO on four tables consecutively which should give Tom “Durrrr” Dwan the advantage since he plays up to seven different tables at once. If you would like to watch any of the matches between Tom “Durrrr” Dwan and Patrik Antonius you can keep watch on the tables that Full Tilt Poker has made specifically for this challenge and they are called “Durrrr Challenge 1, 2, 3, 4”. There has currently only been one session that has taken place with these two professionals and Tom “Durrrr” Dwan is currently up $134,911 after 1,541. We will keep watch and update you on any huge downswings or rushes that these two players have.